Calphalon 12-Inch Everyday Pan Just $53.68! Down From $113! PLUS FREE Shipping! You are here: Home / Great Deals / Amazon Deals / Calphalon 12-Inch Everyday Pan Just $53.68! Down From $113! PLUS FREE Shipping! Don’t miss this amazing deal from Amazon! Get this Calphalon Contemporary Nonstick 12-Inch Everyday Pan for just $53.68 down from $113.00 PLUS FREE shipping! The Calphalon Contemporary Nonstick 12-inch Covered Everyday Pan features a stylish, modern design that looks great in the kitchen while offering reliable everyday performance. 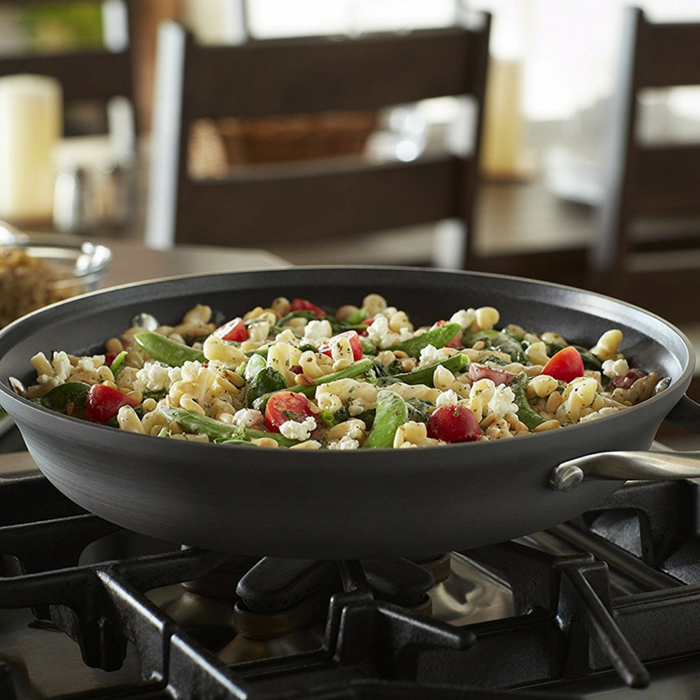 Shaped like a traditional sauté pan but with two loop handles instead of a traditional long handle, this everyday pan moves seamlessly from stovetop to oven to the table. And unlike most hard-anodized cookware, this everyday pan is dishwasher-safe. The Calphalon Contemporary Nonstick 12-inch Covered Everyday Pan is oven safe to 450 degrees Fahrenheit and backed by a lifetime warranty! Heavy-gauge aluminum construction ensures even heating and is hard-anodized for durability. Interior includes three layers of nonstick coating: two layers provide durability and the third layer offers easy release performance. Shaped like a traditional sauté pan, but with two loop handles so it easily moves from stovetop to oven to table. Ideal for casseroles and “brown and braise” recipes. The nonstick surface means you can cook healthier using less fat, with effortless cleanup. Comes with Calphalon’s full lifetime warranty.